The influence of Woody Guthrie continues even after so many years. 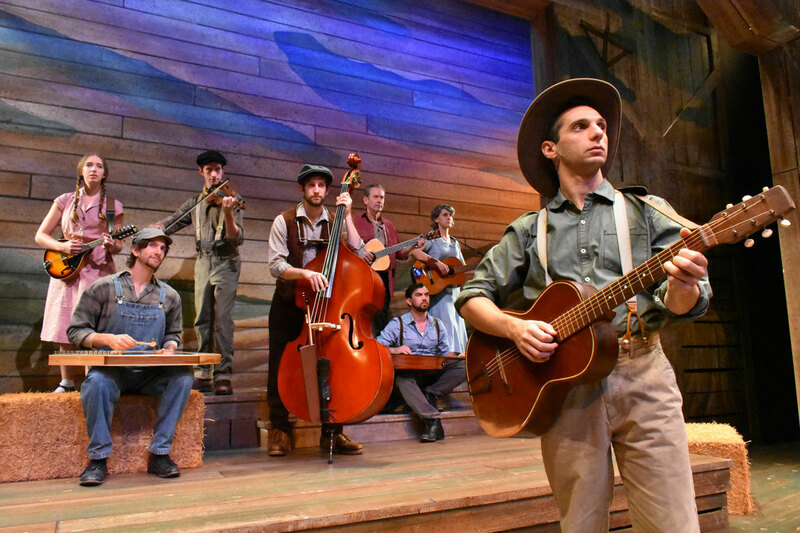 This musical at Palm Beach Dramaworks tells a particular story of this iconic American folk singer who became the author of hard-hitting songs for hard-hit people, and America’s optional national anthem, This Land is Your Land. “Any fool can make something complicated. It takes a genius to make it simple,” said Woody Guthrie, a prolific songwriter and American icon whose folk songs have become staples in the canon of American music. And as Palm Beach Dramaworks’ mission is to produce the classics or look for material that creates good storytelling, it shouldn’t come as any surprise to find this powerful and poetic story come to its main stage, now until August 5. “Woody Guthrie’s American Songs” is a musical by Peter Glazer, who conceived and adapted Guthrie’s songs and writings. With orchestrations and vocal arrangements by Jeff Waxman, it has been exploding in America’s theaters since its premiere in 1988. They all tell a tale. When you hear the lyrics of “I Ain’t Got No Home in This World Anymore,” and you’ve been foreclosed by a bank, the words are strong. This story-song narrative is definitely captivated by the lyrics—songs all based on what Guthrie heard from America’s out-of-work struggling class as he traveled with his “gee-tar” on his back. Known as a simple guy who grew up in Oklahoma, Guthrie took to the road after the dust storms destroyed the lives of his farm folk neighbors, leaving behind his young wife and three kids. Interesting how the musical doesn’t spend much time delving on this shocking family matter, or the repercussions of his actions, but there you have it—a man traveling alone, meeting others on a train en route to California—the new Garden of Eden—in search for a fresh new start. He traveled to almost all the 48 states, meeting and singing about our country’s most underprivileged folks. Throughout Guthrie’s life, and later, from the 30s, 40s and 50s, the folk singer was somehow affected by various historical events, such as The Great Depression, the Great Dust Storm, World War II, and the political divisions in our country caused by the Communist Party and the Cold War. It was these changes in society that influenced Guthrie to write music and books, turning him into a poet of the people—much like Bob Dylan’s poetry did a decade later in the 60s. Inspired by Guthrie at a young age, later on Dylan even adopted Guthrie’s Okie accent. Like Guthrie’s, Dylan’s songs went on to become quite instrumental in changing the course of history, and even society’s view of government, immigration, music, public opinion, and racism—subjects that are very much prevalent in current news feeds. As those subjects are processed in an individual’s mind, perhaps the greatest realization when you experience a musical piece such as this, is that art is not just what you hear, it’s also what you see, and the way a character is developed through movement, speech, song and dance in order to bring forth a story and a theme. In the end, drawing people into the artform. From such pivotal American singer-songwriters such as Bob Dylan and Bruce Springsteen, to The Lubben Brothers, Woody Guthrie’s all American folk singing influence has been immense. Woody Guthrie’s story is timeless, and eerily relatable to the plight of everyman in America today. It runs through August 5 at Palm Beach Dramaworks. For more information or to buy tickets, please visit www.palmbeachdramaworks.org.